This was first published as a guest post on the IABC UK blog of the International Association of Business Communicators. Maybe I was just hooked by the title, “Power to the people”. What’s not exciting about that for a professional facilitator – especially one “passionate about participation and leadership”? But why would I attend a conference of the communications profession – isn’t that all just about clever marketing copy? Well, according to the copy, this year’s IABC Europe MENA conference is about about “the two most challenging aspects of communication today – people’s opportunity to be heard (encouraging ideas, innovation, etc. ), and best practice to create practical action”. Which does sound quite a lot like facilitation to me. Besides, as a freelancer, I do have a use for marketing copy – and for extending my networks. I began to learn of IABC, and the value of facilitation to communications professionals, through meeting and working with Michael Ambjorn, now IABC Vice Chair. He and I worked together, on behalf of the RSA and ICA:UK respectively, to apply ICA’s Technology of Participation facilitation approach to help the RSA to engage with and mobilise its 27,000 Fellows worldwide. We developed what we called the RSA Small Groups methodolgy, to enable the RSA to increase it’s social impact and achieve its ambition of being ‘the best place to have an idea’. We worked together again, this time also with IABC members Jo Anstey and Bent Sorensen, on #ETF20 – a facilitated process designed to creatively engage a diverse, international staff team of around 120, both face-to-face and online, to reflect, learn and bond together in celebrating 20 years of collective achievement. So I am keen to learn at EuroComm about how others in the communications profession are, or could be, applying facilitation to their address their challenges. I am particularly attracted by session titles such as “The Power of Participation”, “Engaging in conversations that matter” and “Listening can change a whole organization”; and session leaders from organisations such as Oxfam and the European Commission, in the sectors that I typically work in myself, as well as those from Royal Dutch Shell, Mars and other corporates that are somewhat familiar to me through the work of facilitation colleagues. I have also been reflecting on the value of communications to facilitation professionals, and am looking forward to exploring that further at EuroComm. When I am contracted as a facilitator to design and lead learning, consultation, engagement or change processes, especially in large organisations or systems and whether face-to-face or online, the effectiveness and impact of my own role is often dependant to some degree on my the broader communications of my client or partner. Will participants arrive with clear and helpful expectations of the process, and will non-participants receive clear and helpful messages on the aims, outcomes and next steps? A good example of where my own facilitation role was dependent to a large degree on wider communications processes in which I was largely not involved is Building a future together – broadening ownership in corporate planning, a 12 month programme engaging over 1,000 stakeholders in developing a new 5-year corporate plan for Bron Afon Community Housing in South Wales. In a 60-day contract spread over a year, the facilitation and training role played by my two colleagues and I could only ever represent a very small (if hopefully significant) fraction of a much wider change process in which broader communications were key. Of course the EuroComm sessions on social media will be of particular interest to me as well, not least because of how much I rely on and enjoy using digitial channels for my own professional networking and for marketing communications. I think it was a year or two year ago, soon after I had completed my term as IAF Chair and Michael had begun his Board role with IABC, that we first spoke of the potential of some sort of partnership between IAF and IABC, to support mutual learning and collaboration between facilitation and communications professionals. Now that such a partnership is in place, I am excited to take advantage and urge others to do likewise. IAF members, join me if you can at EuroComm in London this month, and otherwise consider the IABC World Conference in San Francisco in June or check the IABC global calendar for an event near you or online. IABC members, join me at the IAF Europe MENA conference in Stockholm in October or, before that, check the IAF world calendar for the North America conference in Banff in May or the Asia conference in Mumbai in August. IABC Londoners, join our monthly IAF London facilitation meet-up, every second Thursday from 6-8pm near Trafalgar Square. Members or not, wherever you are, do at least follow and engage with me and others at #EuroComm on twitter – see you there! In January 2011 I had a speculative meeting with RSA Chief Executive Matthew Taylor to talk about facilitation and how it might add value to the RSA and its mission of ‘finding innovative practical solutions to today’s social challenges’. I found Matthew intrigued by the practical and philosophical questions of what it takes for a small group of people to transform a good idea into practical action and social impact (I thought to myself ‘yes Margaret Mead, of course, but how exactly?’) We quickly concluded that skills and methods of effective facilitation might indeed add value, and set to talking about what could be done to develop them systematically within the RSA. Matthew then introduced me to the RSA’s Head of Fellowship Michael Ambjorn. The result was an ongoing partnership between ICA:UK and the RSA to develop a ‘small group methodology’, founded on ICA’s Technology of Participation, to help the RSA to engage with and mobilise its Fellowship – to increase it’s social impact, and achieve its ambition of being ‘the best place to have an idea’. Michael has now recently stepped down from his RSA staff role, as I stepped down from my ICA:UK staff role last year. In reflecting on his tenure in A few notes on Fellowship 2010-13, he describes the RSA Small Groups methodology as one of four planks of the strategy by which the Fellowship Team has sought ‘to deliver on Trustees’ ambition that the RSA should support its most active, engaged and innovative Fellows, and that they should see the RSA as a major resource for the achievement of their goals’. In another recent post, RSA West & South West Regional Programme manager Lou Matter reports in Learning through facilitation and working in partnership on recent facilitation training for Fellows held in Bristol, one of a series of recent courses around the regions and the latest phase in the unfolding partnership. An overview of the partnership and the methodology can be found here on my blog, in the presentation I prepared for the Moscow Facilitators conference earlier this year Facilitating innovative practical solutions to today’s social challenges. As I commented on Michael’s post, it has been a real pleasure working with him and the RSA these past few years. Two and a half years is not a long time to embed significant change, however – least of all for an organisation founded in 1754, with a Fellowship now numbering 27,000. I believe we have barely begun to see the impact that facilitation could have for the RSA, so I do hope that this approach may continue to enjoy such support under new leadership. I certainly hope to be able to continue to lend support as an active and engaged Fellow myself, and I hope and expect we can count on Michael to do likewise! 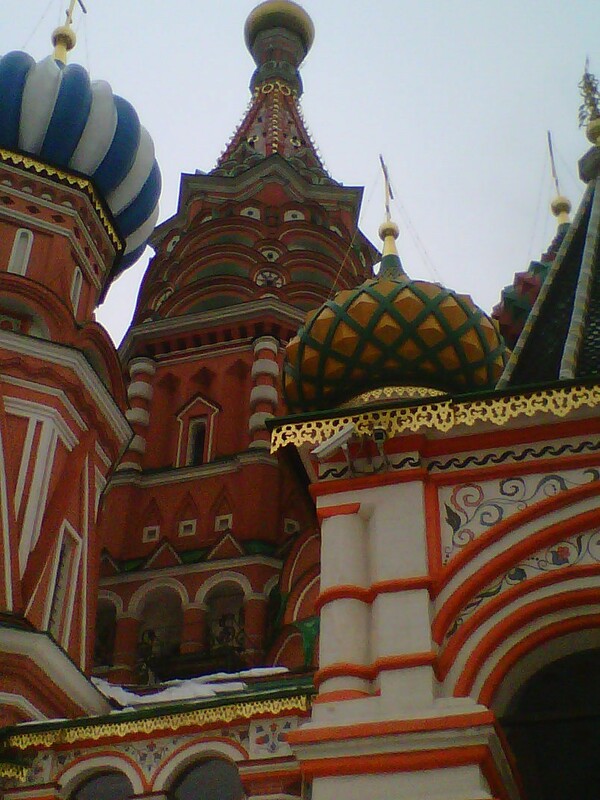 The first week of April was Facilitation Week in Moscow. The centrepiece of the week was the 4th annual Moscow Facilitators Conference, held on April 5th. This was accompanied by two days of facilitation training before the conference and another two days afterwards. The conference week was convened by Liudmila Dudorova, chair of the IAF Russia chapter, and her facilitation company Personal Image. The annual conference under Liudmila’s leadership has clearly played a significant role in promoting facilitation in Russia and attracting increasing numbers of Russian facilitators to IAF, as evidenced by the ever growing numbers of Russian delegates at the annual IAF Europe conference. The conference itself attracted around 65 delegates at the four star Vega conference hotel, for a full day programme from 10am-7pm. Most came from Moscow, but some also from other regions of Russia and from neighbouring countries. Most were leaders, managers and practitioners within large Russian companies, or independent professional facilitators and other professional contractors who offer facilitation alongside other services. The conference theme of idea generation, innovation and the exchange of experience was explored through eight sessions, in plenary and in two parallel groups. I was delighted to be invited to join as an international guest presenter, along with Bruce Rowling of Pinpoint Facilitation. Bruce has worked with Liudmila and her company in Russia over several years, but for me it was my first visit so I was delighted to be able to see something of Moscow while I was there. I provided two days of pre-conference training to a group of 28, introducing three of ICA’s Technology of Participation (ToP) facilitation methods, namely Focused Conversation, Consensus Workshop and Action Planning. I also provided a keynote presentation to the conference, sharing some experience of how these methods have been applied by ICA:UK in partnership with the Royal Society of Arts – in engaging and mobilising the RSA’s 27,000 Fellows to contribute to social impact through civic innovation, toward achieving the RSA’s ambition to be ‘the best place to have an idea’. My presentation can be viewed in my recent post. Bruce provided a conference session and post-conference training drawing on the Pinpoint approach and graphic facilitation. Neither of us would have been of much use to anyone without the expert and tireless interpretation of Mikhail Rossus, although Bruce was at least adept at Russian small talk involving hello, vodka, thank you and goodbye! I am grateful to ICA Ukraine for providing ToP training materials in Russian for me. Further conference sessions included Liudmila’s own masterclass on facilitating creativity and innovation in companies, Tim Nestik on knowledge management, Alexander Dudurov on graphic facilitation, Alexandra Kosulina & Mariya Pronina on idea generation, Victoria Bekhtereva on innovation projects and Julia Linkin with a case study of Open Space facilitation in a bank. Creativity was emphasised throughout the day, starting with a jazz duo accompanying our opening exercise to depict how we generate ideas, by collage in the style of Matisse! I experienced a great spirit of sharing and learning at the conference, just as at all the IAF conferences I have attended, and clearly a great passion for facilitation. I also experienced a great hunger for tools and methods, and a particular sense of urgency in learning and applying them. When I asked what participants hoped to gain from my conference session, the majority of responses were to do with tools and methods to apply. In tailoring my pre-conference training in advance, I was advised that participants would appreciate more methods and want little time on practice and planning to apply what they had learned, and this was certainly borne out in my experience. In another conversation a conference delegate suggested to me that Russians like to learn and apply quickly because they feel they have some catching up to do – and they intend to catch up and overtake. Certainly few UK courses I have delivered have attracted such close (and very welcome) attention as this one. Every moment’s break was taken as an opportunity to photograph the latest graphics, flipcharts or cards on the sticky wall for later reference, and several audio devices were recording the whole course for later playback. I left in no doubt that ToP methods will find a valuable and active place in the toolkits of many Russian facilitators, and that facilitation itself has an important role to play in Russia. I am very grateful top Liudmila and Mikhail for hosting me so generously, and to everyone involved for making my first trip to Moscow such a memorable and enjoyable one. I look forward to following the further growth and development of facilitation and IAF in Russia through the many new connections I made in Moscow. Also I hope that other chapters of IAF in Europe and elsewhere (my own England & Wales chapter included) might emulate the Moscow Facilitators Conference in its approach! Many thanks to Liudmila Dudorov and Mikhail Rossus and all at GoTraining & IAF Russia for hosting me so well, and to them and all who attended my course and conference presentation for making my first trip to Moscow such a memorable and enjoyable one. The 4th annual Moscow Facilitators conference attracted around 60 delegates, and my pre-conference training 28. There is clearly a passion for facilitation here in Russia, and a hunger for methods and tools – and a sense of urgency about getting and applying them. It seems to be an exciting place to be a facilitator! My full conference presentation is available in English & Russian by clicking on the images above. I am delighted to have the opportunity to deliver a conference master class and two days of pre-conference training for the 4th annual Facilitators Conference of IAF Russia, in Moscow from April 3-5. See the conference website in Russian or an approximate English translation, including a video clip (above) of me conveying greetings as IAF Chair to last year’s conference. This clip was recorded by conference organiser Liudmila Dudorova during the ICA:UK Participatory Strategic Planning training that she attended with me in London last year. I shall be joined as international VIP presenter by Bruce Rowling of UK-based Pinpoint Facilitation. The pre-conference training will be specially adapted from ICA:UK’s Group Facilitation Methods and Action Planning courses, with Russian language materials kindly supplied by ICA Ukraine. Both the training and the conference session will be delivered in Russian by simultaneous interpretation. The RSA (www.thersa.org) is an enlightenment organisation committed to finding innovative practical solutions to today’s social challenges. Through its ideas, research and 27,000-strong Fellowship it seeks to understand and enhance human capability so we can close the gap between today’s reality and people’s hopes for a better world. ICA:UK, the participation and development charity (www.ica-uk.org.uk), is one of the Institute of Cultural Affairs’ (ICA’s) global network of non-profit, non-governmental organisations working to develop, test and demonstrate effective approaches to personal, organisational and social transformation. ICA:UK applies this approach to developing and sustaining a culture of participation, specialising in the Technology of Participation and working with others both nationally and internationally to demonstrate effective facilitation, to train people in facilitation methods and skills, and to research the application of participatory approaches in new areas. Since 2011 ICA:UK has partnered with the RSA to help it engage with and mobilise its Fellowship, to increase it’s social impact and achieve its ambition of being ‘the best place to have an idea’. In this highly interactive session, Martin Gilbraith will share some examples of the approach used and its impact to date, and some of the learnings of those involved. Participants will be introduced to some key elements of the ToP methodology, including simple but powerful tools that they can take away and try.